Hi everyone. 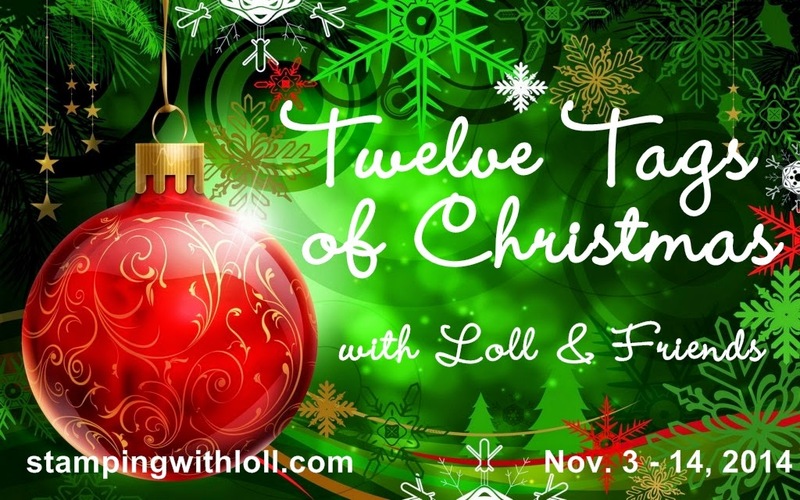 Welcome to Day Seven of my "Twelve Tags of Christmas" Event. In case this is your first visit, I am posting twelve days of mixed media Christmas tags. And I have a special Guest Designer joining me each day. We hope our tags inspire you! 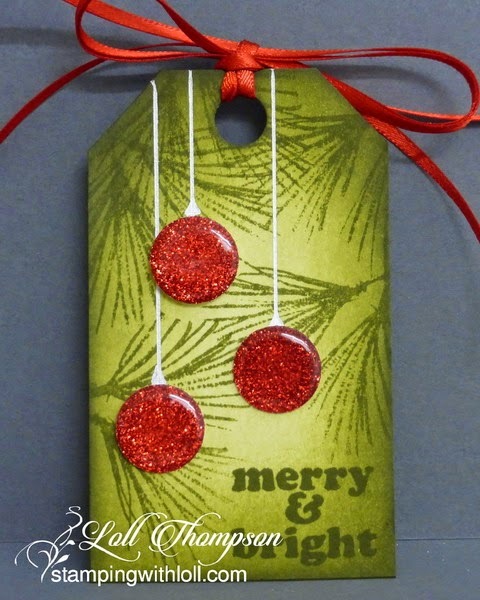 Come join in the fun and link up your Mixed Media* Christmas tags below. The tag (2 1/8" x 3 5/8") was sponged all over with Shabby Shutters Distress Ink. Forest Moss Distress ink was sponged around the outside edges to add depth. Several pine sprigs (Watercolor Winter stamp from SU!) were stamped around the tag using second generation stamping (stamped off once onto scrap then stamped onto the tag). The ornaments are 5/8" circles cut from red glitter paper and covered with Glossy Accents for shine and dimension. A silver metallic pen was used to draw in the hangers for the ornaments. The sentiment was stamped at the bottom with Forest Moss ink. And finally, two strands of 1/4" Real Red ribbon was tied to the top of the tag. Today's special Guest Designer is Bonnie (Stamping with Klass). The first time I saw Bonnie's cards was on SCS, which led me to her blog. She is on the Design Team for Merry Monday Challenges, and I was so inspired by Bonnie's beautiful Christmas cards, I entered the challenges and eventually joined the Merry Monday design team for six months. She makes gorgeous cards using lots of different techniques, and holds regular classes to teach others. Bonnie still works hard for the Merry Monday Challenge team, producing gorgeous Christmas cards every week throughout the year ... that takes dedication!! I hope you'll check out her fabulous blog, and spend some time perusing through her amazing creations. Details on how she made the beautiful tag below are also on her blog --- don't miss it! Thanks Bonnie ... this is gorgeous!! I LOVE your glassy, glittery ornaments! What a great idea! They are extra pretty against the sponged and stamped background! Thanks so much for including me in your challenge! What an honour! Bonnie's gorgeous background and sparkly snowflakes is so wonderful too. I just went to Bonnie's blog for all her deets. Way cool the way she stamped her gorgeous background. Another really beautiful tag, Loll! I love how you created the ornaments and your background is stunning! Oops, not sure if my comment is going to appear twice, I think I pressed the wrong button LOL. Loll and Bonnie your tags are gorgeous!! Nancy Littrell kindly introduced me to your fun event. Loll your blog is wonderful!! Love the glossy accents ornaments! Such a great idea. And Bonnie's tag is gorgeous (my favourite blue - love it with the white and silver). Your red ornaments are gorgeous in their sparkle and shine Loll - especially against the green - and what great silver strings you drew on! 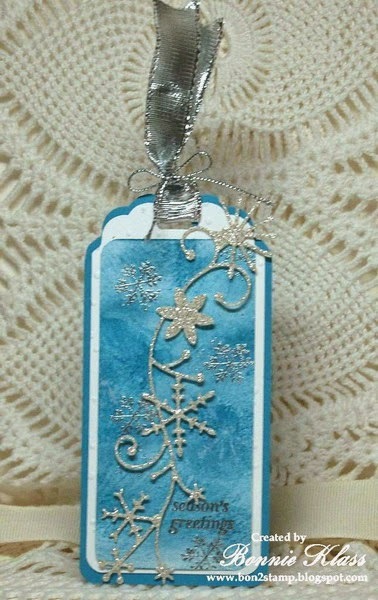 Bonnie's tag is so pretty in the blue and silver with that delicate die cut! Another brilliant design with how you made those ornaments, Loll! Love the look! Bonnie's tag is such a frosty beauty! Wow! I love the glossy accents on the glitter! The colours in Bonnie's tag are so classy (no pun intended!). Another 2 gorgeous tags! Two more 'gaze in admiration and awe' tags, Loll. You really are amping up my incentive to bring out the distress inks and give them another 'go' on a smaller canvas. Inspiration, galore! Wow, Loll, those ornaments are so cool. Have to give GA on glitter CS a try. TFS.